My grandma is really into wearing “batwing” sweaters, which are immensely popular right now (she’s been wearing them since the 80’s when they were last trendy). Like fashion, what’s old is always new again in gastronomy. Brussels sprouts are on every menu, anchovies are back on pizzas, and kale salad is the new arugula salad. I was turned on to this particular recipe around Memorial Day, when my friend B, a New Yorker, prepared this on our annual girls weekend in Big Sur. We had procured beautiful salmon steaks, sweet summer corn, artichokes, and bunches of kale from a farmer’s stand. B had been obsessively making this Kale Salad recipe on Food52 for several months and was convinced we’d love it, too. We hated it! I may have likened eating her raw kale leaf concoction to chewing leathery cardboard. Raw kale…seriously?! It wasn’t until September that I noticed a pre-packaged, pre-dressed kale salad being sold at Berkeley Bowl and decided to give my leathery friend another taste. Dressed like an Asian slaw with red cabbage, carrots, sesame seeds and a rice vinaigrette, this kale salad was far less intimidating and absolutely delicious. The difference? This salad had been sitting on the shelf fully dressed for several hours and the acid in the dressing had broken down the tough kale leaves into a palatable texture similar to a thin cabbage leaf — crispy and fresh, yet perfectly infused with dressing. Inspired by my discovery, I retried B’s salad and let it sit for several hours before nibbling. One bite, and my prejudice against raw kale changed forever. The salad was even great the next day! 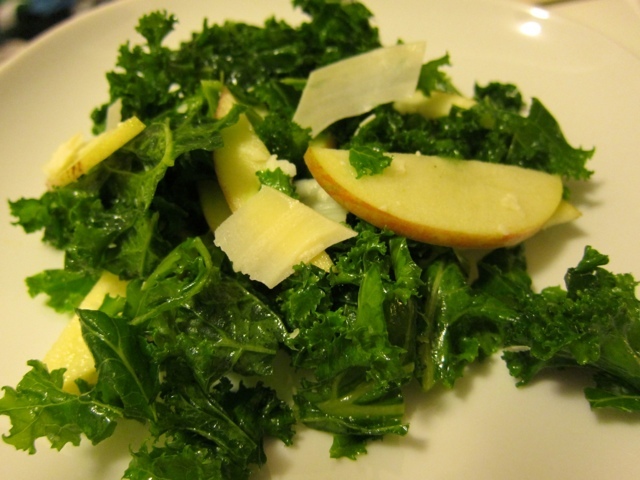 In a large bowl, combine the kale, onions, olive oil, vinegar, lemon juice, salt and pepper. Mix with your hands to really blend the dressing and rub it into the greens. Let the salad sit while you prepare the rest. Core the apple. Thinly slice from stem to end. Add the apples to the salad and gently fold together so they don’t break in half. Taste and adjust seasonings. Sprinkle with the hazelnuts and cheese shavings.